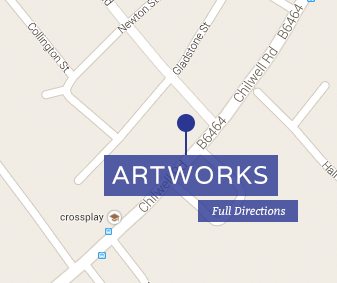 Artworks Nottingham has been established in Beeston, Nottingham, since 2005 and it is a family-run arts and crafts business. We offer a great selection of craft materials and handmade gifts as well as a wide range of classes and workshops. Our craft materials are perfect for any type of crafter, so whether you are an experienced crafter, a card maker, a little crafter, a model maker or an architecture student, at Artworks you will find all the materials you need for your project. For little crafters, we offer multiple craft kits from Button Bag, Little Experience and Fimo while for needle crafters we hold various cross stitch kits and accessories from DMC, including Aida, silk and wool threads. Model makers and arts students can find a varied stock of mount-board, foam-board, and plaster of Paris, air drying clay and drawing materials. At Artworks, we continue to add stock all the time. If you're based in Nottingham and you are interested in craft materials and discovering new crafts, why not give us a call on 01159 223 743 or visit us in our showroom? We'll be happy to show you around and offer you more details about our products and how you can use them.